After the grand successes of both the video promos, Aathi and Selfie Pulla, team Kaththi is all geared up to release the long awaited trailer of the movie. Yes it is official now - the trailer is all set to release on 19th October Sunday, 3 days prior to the release of the movie. "The wait is over, Kathti trailer at 6pm"
There you go, the news is straight from the horse's mouth. 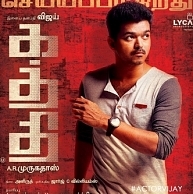 An exciting day on cards for all the Vijay fans. Stay tuned for instant updates and our trailer review as well! People looking for online information on Anirudh, Ilayathalapathy, Kaththi, Kaththi Trailer, Samantha, Vijay will find this news story useful.